How many e-mails do you have to send to invite your public to Events? Every e-mail contain a single message (invitation, “please register yourself”, time and place, program, …) and your customers very often may loose your single message. What it could be if you were able to have only one tool, instead many single communications, to make your guests perform all the actions you want them to perform? And what about to give your guest the opportunity to have every time, with every device (mobile phone, pc, etc), only one place to see all the necessary information about the Event refreshed in every phase (teaser, invitation, event and after event)? 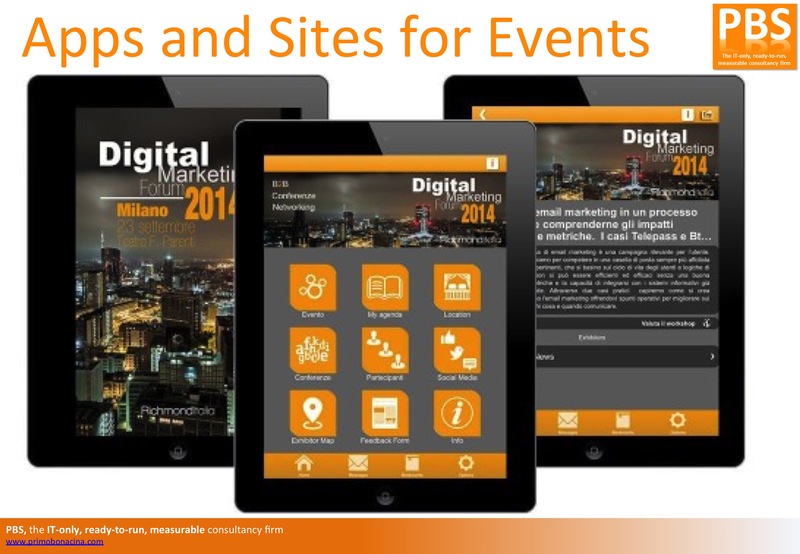 The Apps and Sites for Events are the right solutions for you! Click on the image below to enlarge it!